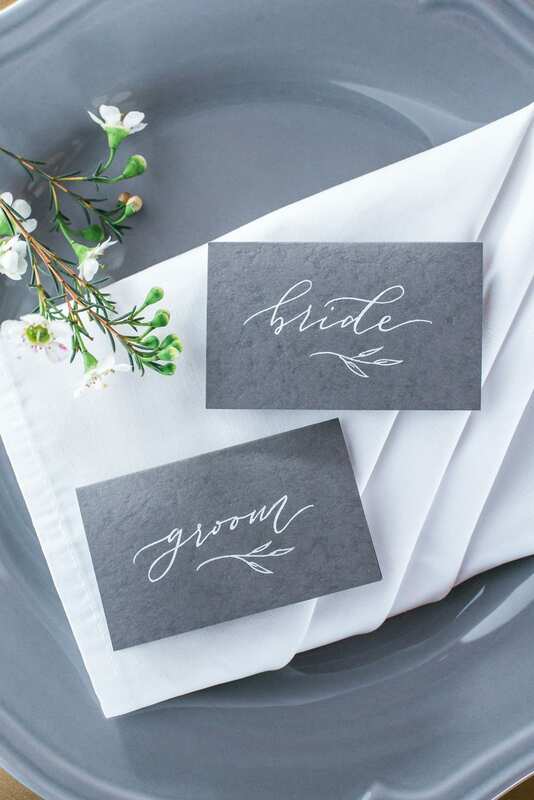 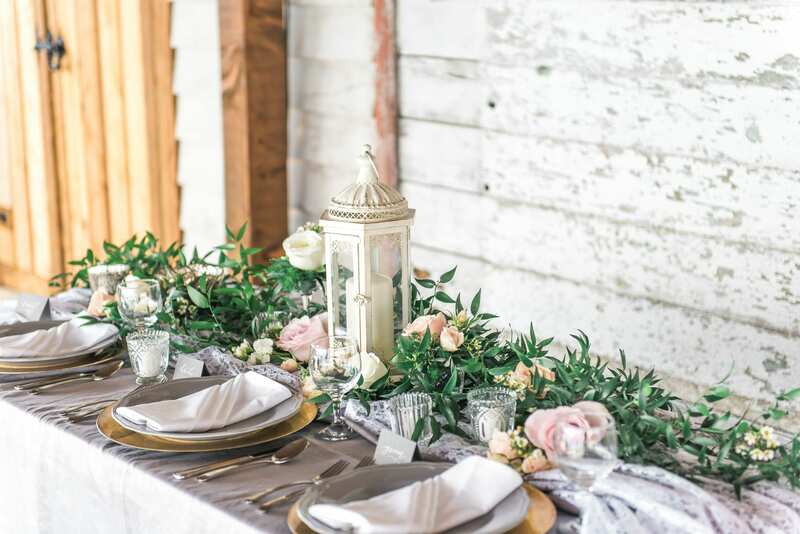 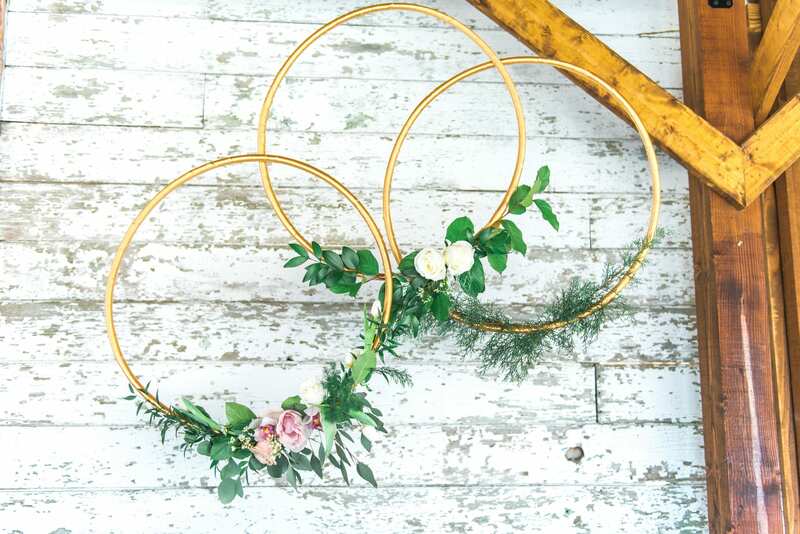 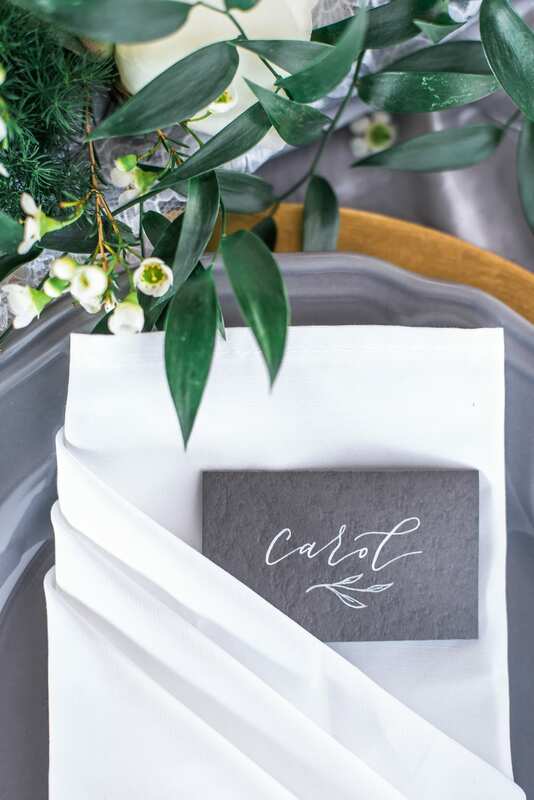 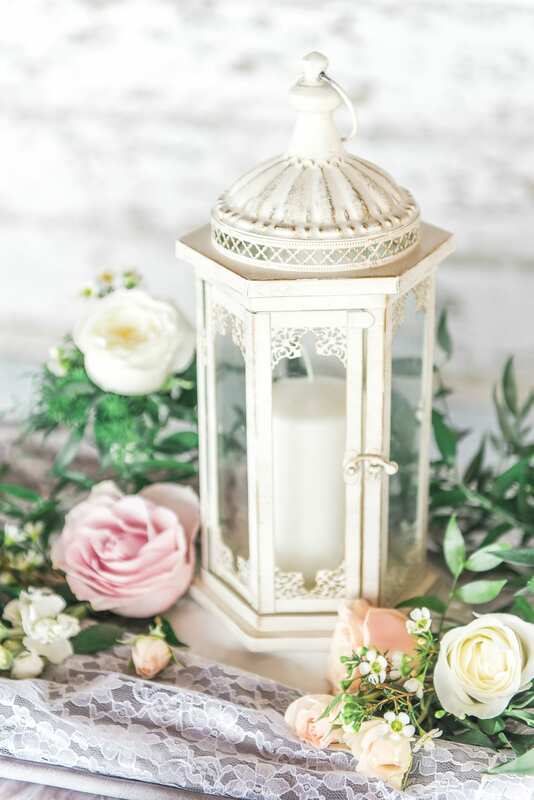 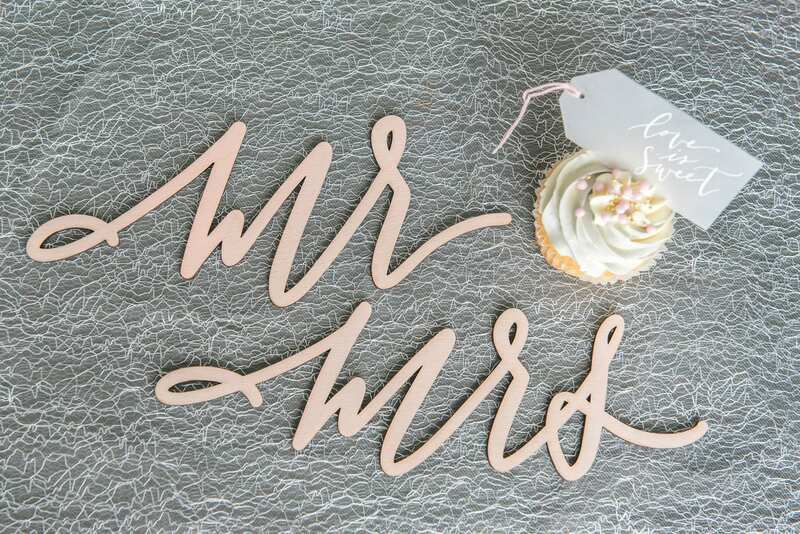 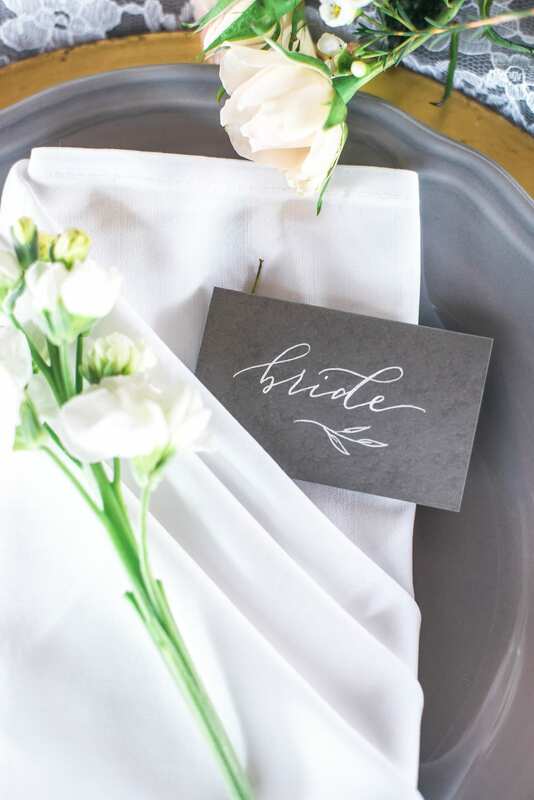 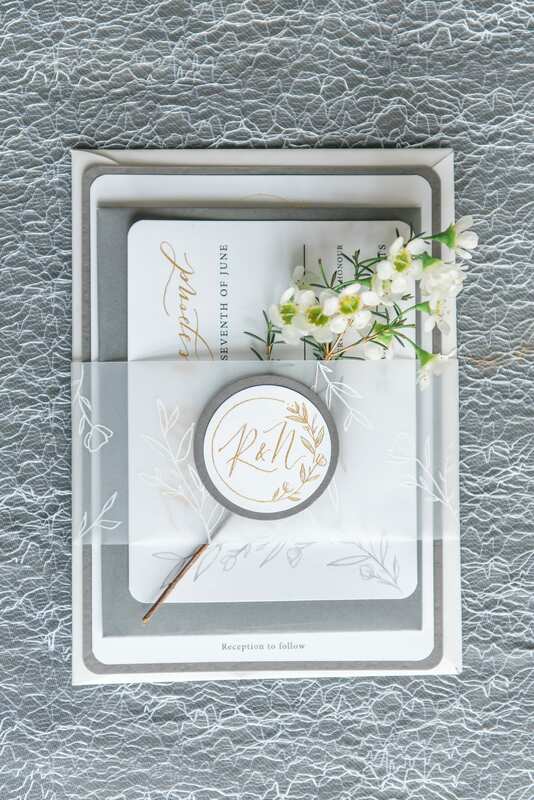 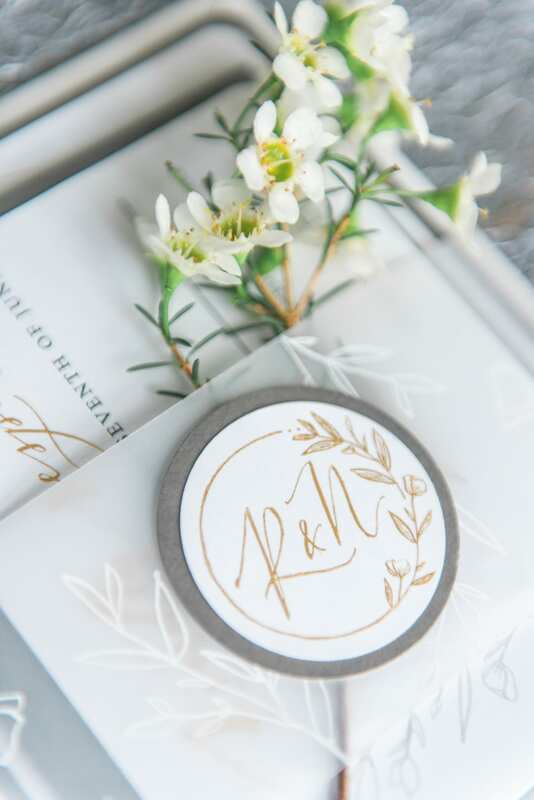 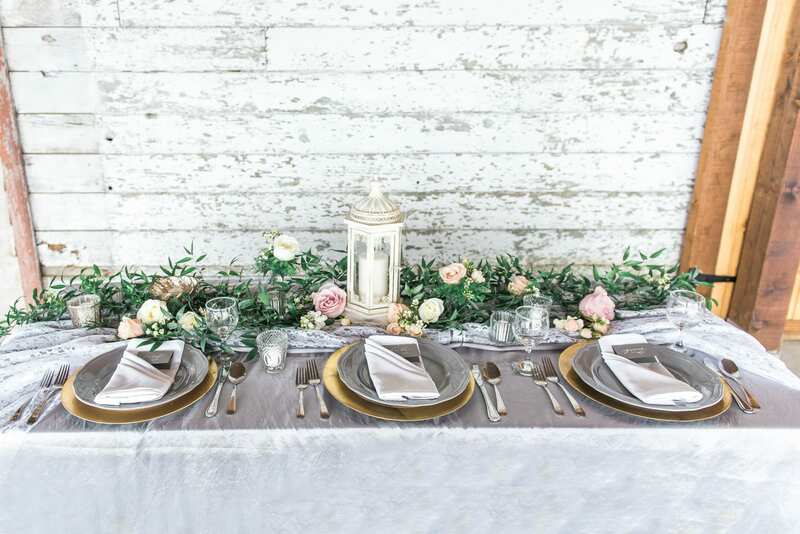 With Pinterest boards and more than ample supply of wedding-themed inspiration, planning can be stressful. 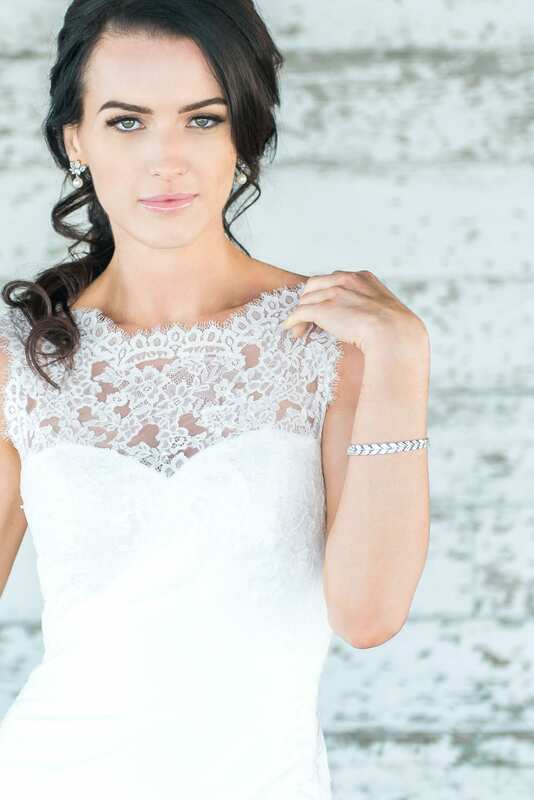 Even more stressful? 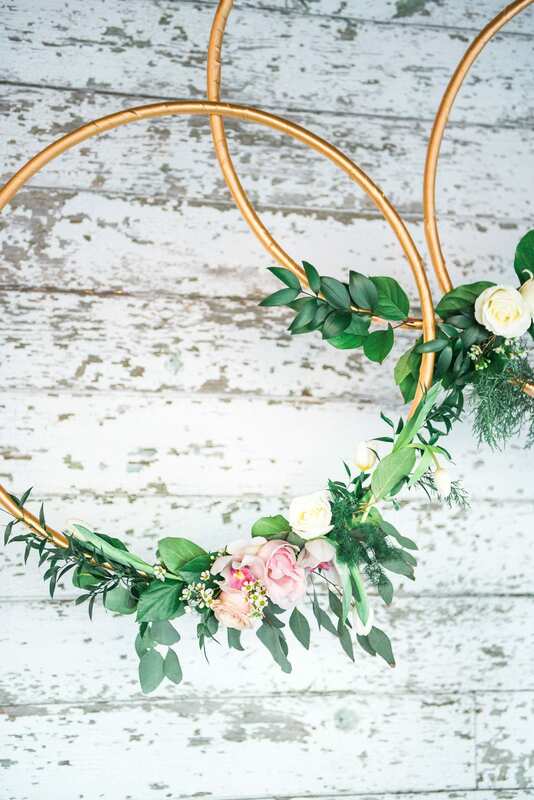 Feeling pressured to nail a Pinterest-worthy look on a tight budget. 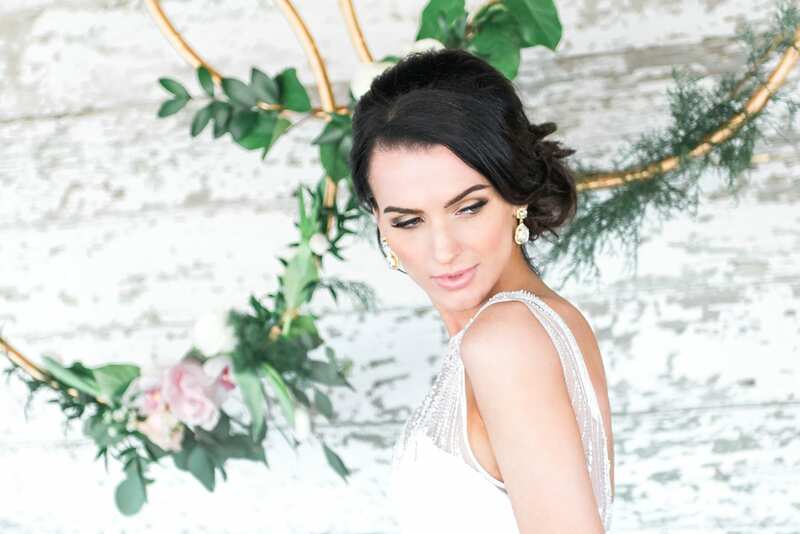 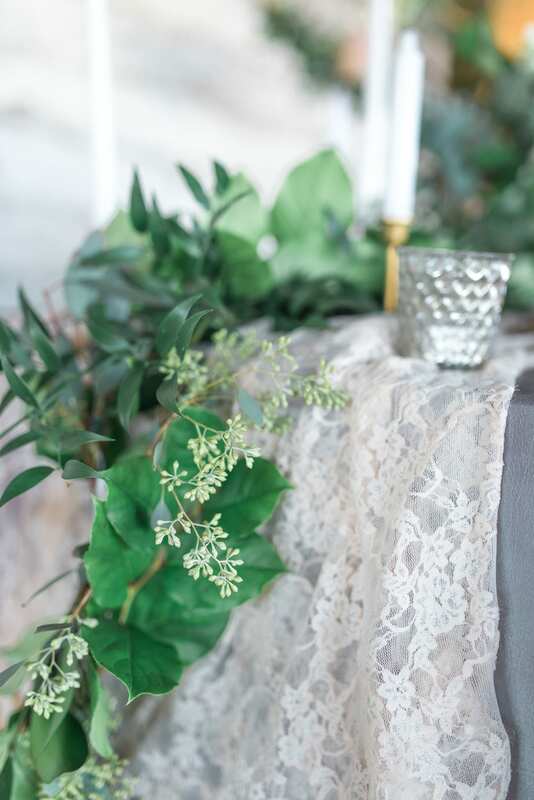 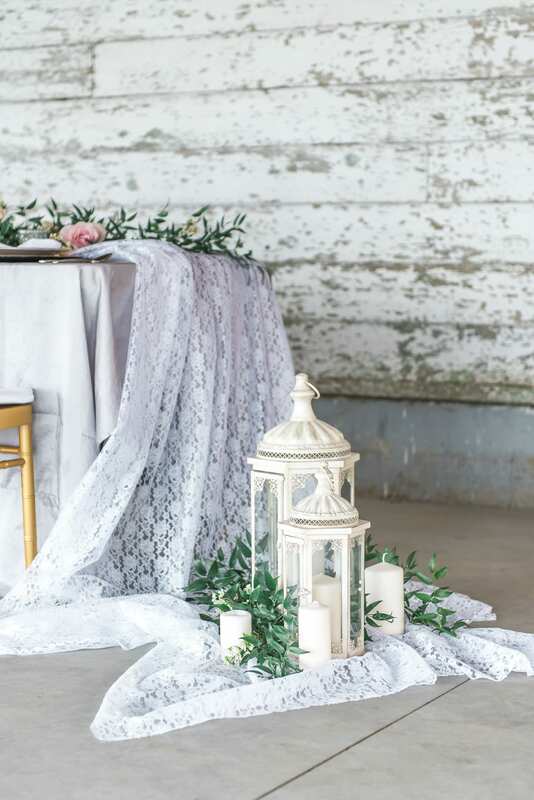 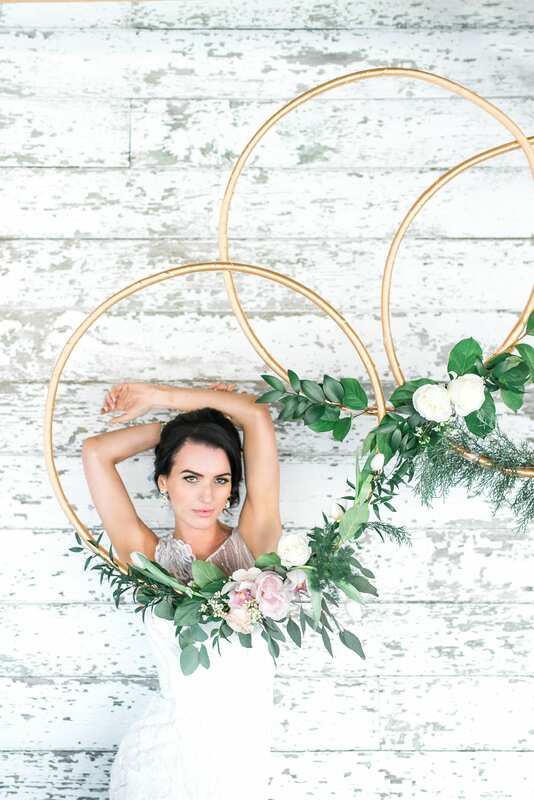 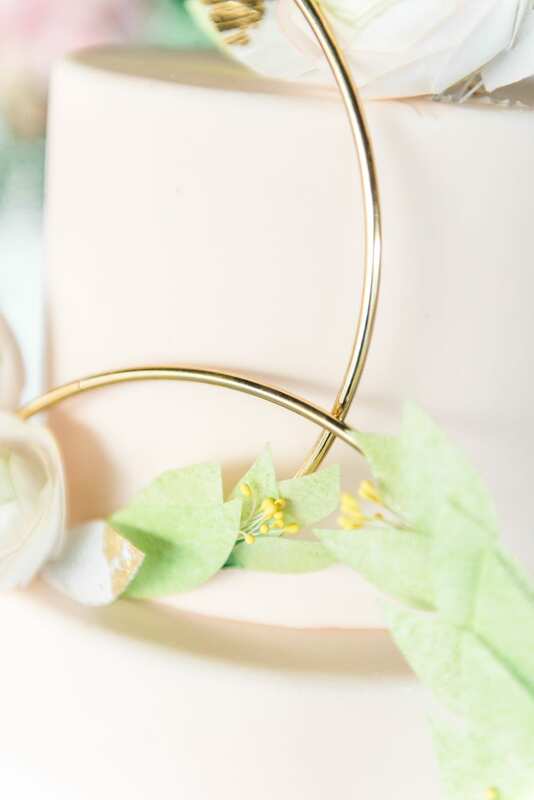 That’s what drove this innovative shoot by L’Estelle Photography: two gorgeous looks in the same theme, at three different, but affordable prices. 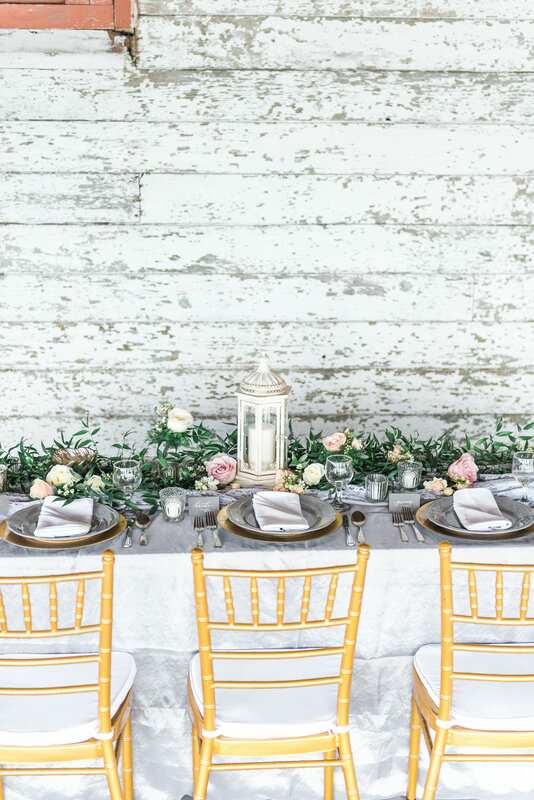 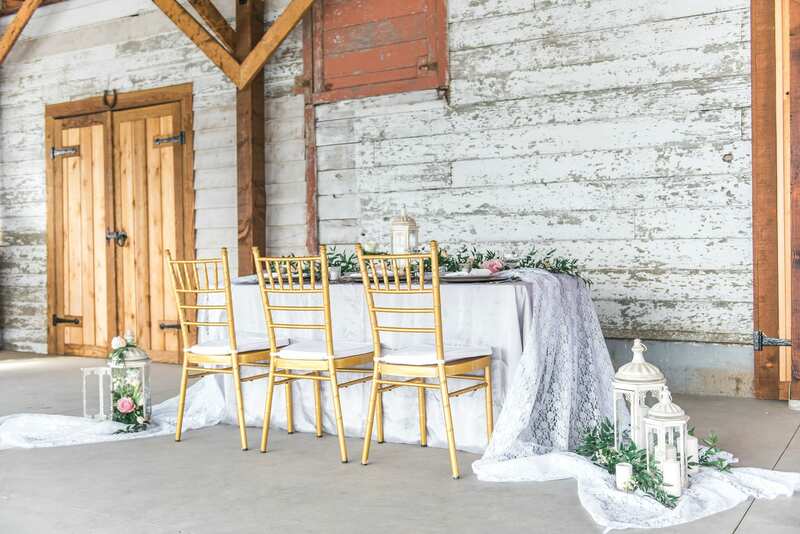 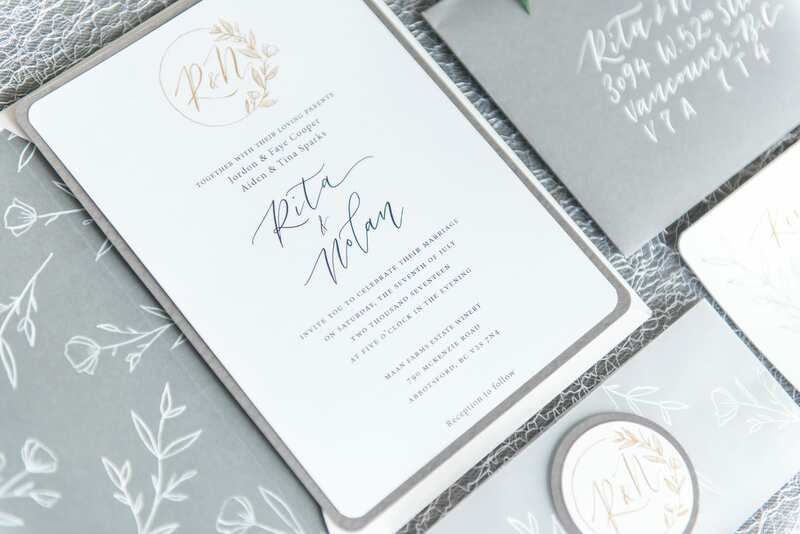 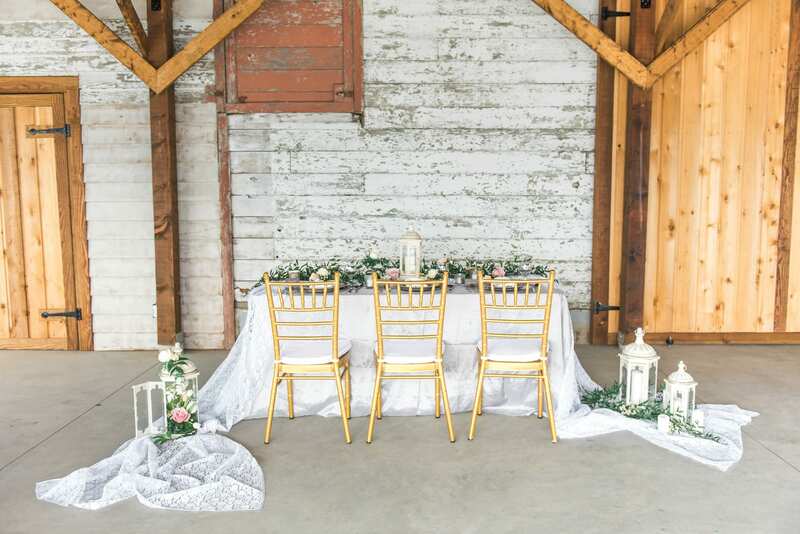 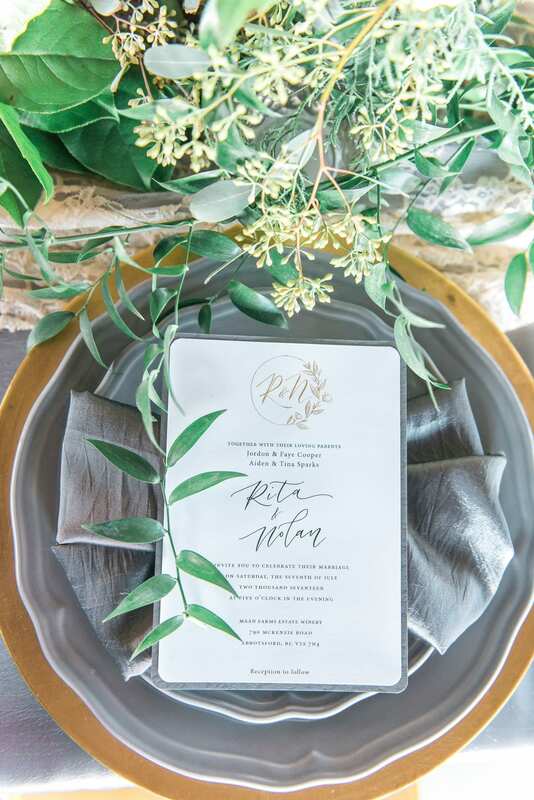 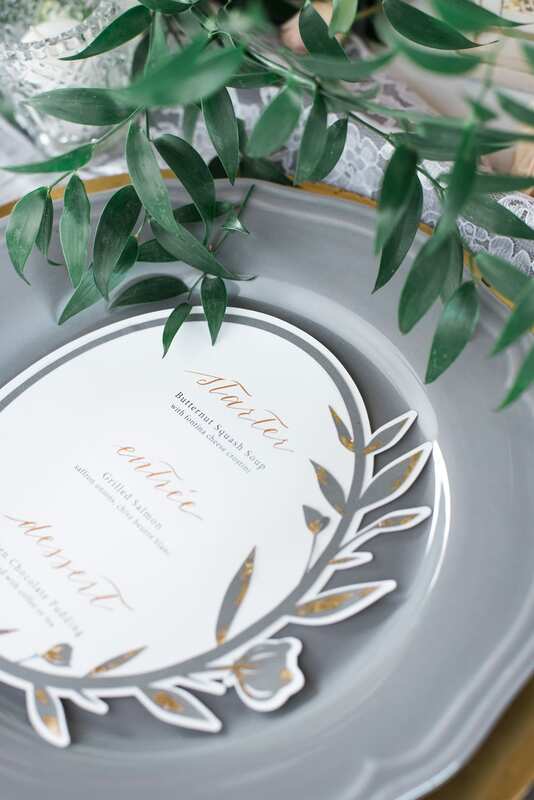 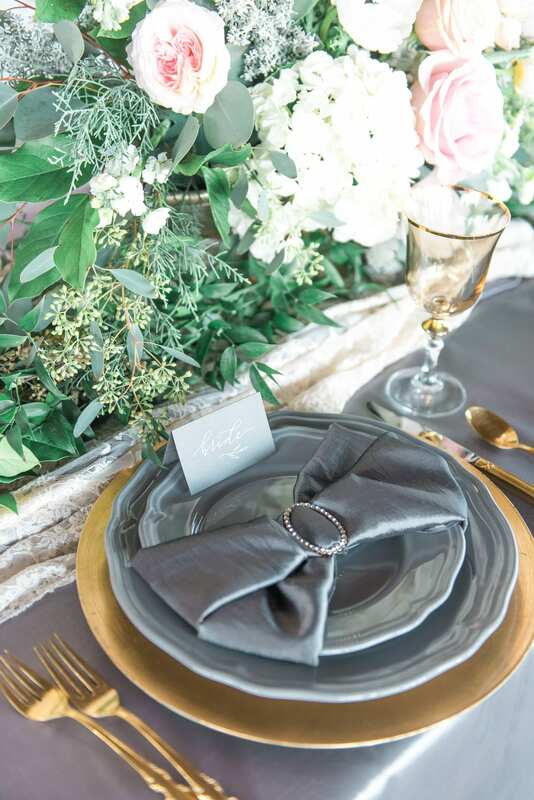 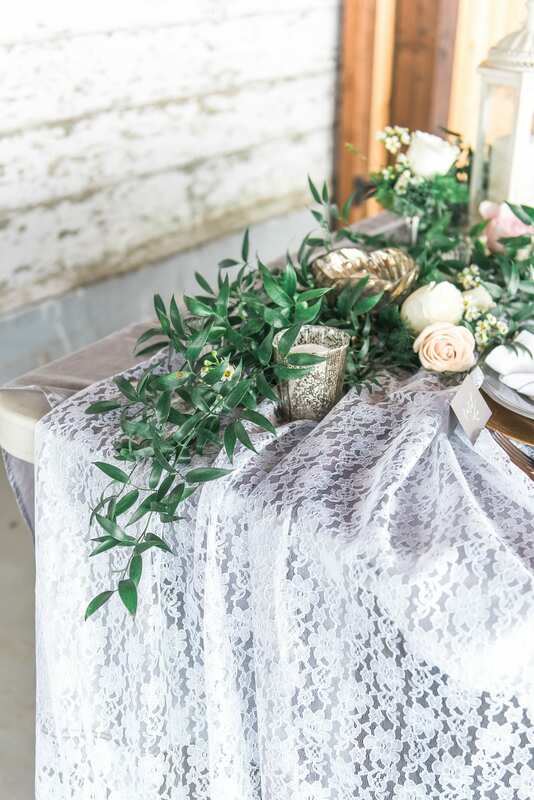 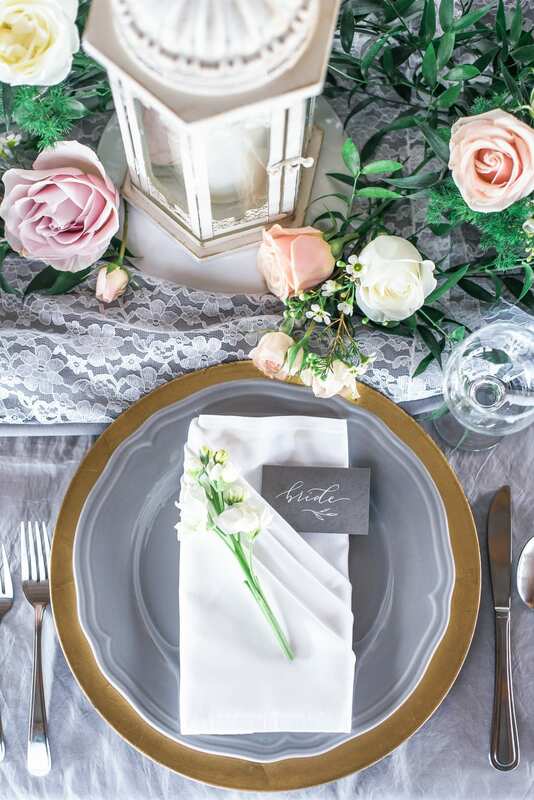 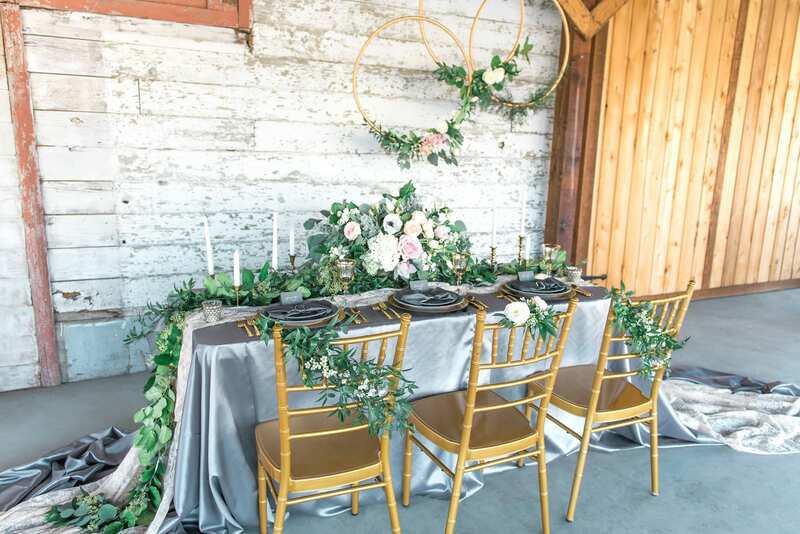 Both looks feature white, grey, and gold hues for a rustic-glam vibe. 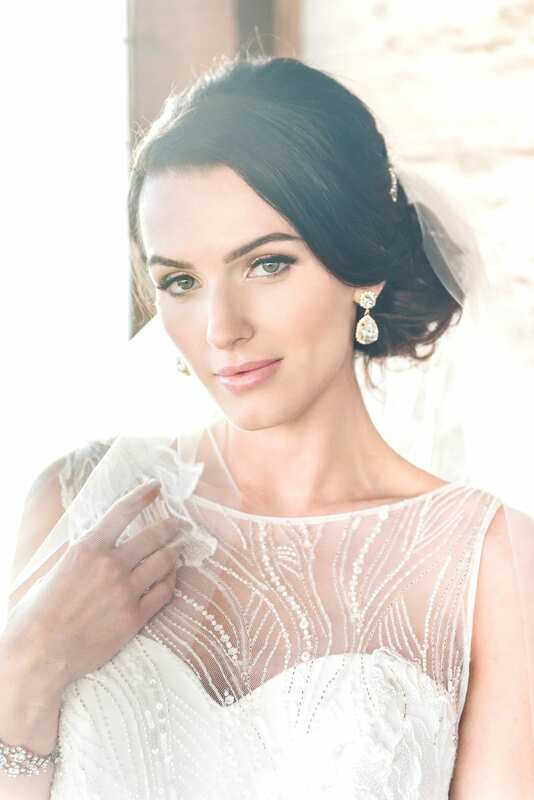 Both featured gowns come from the Pronovias Collection. 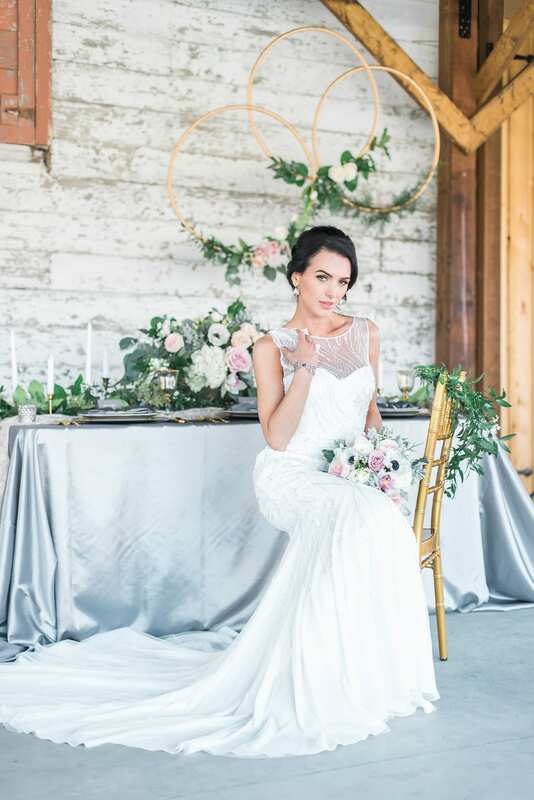 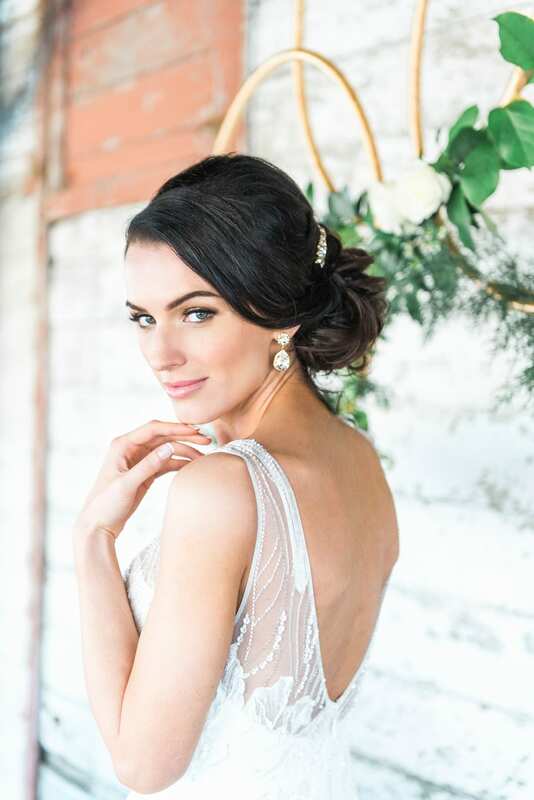 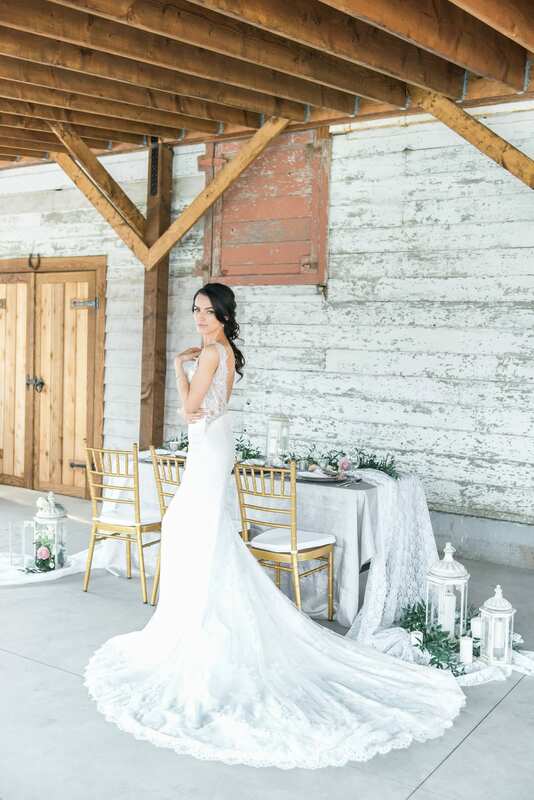 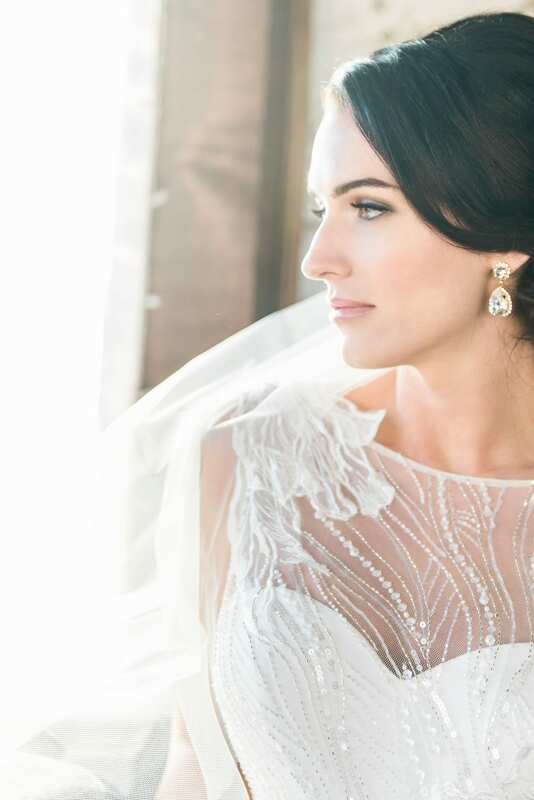 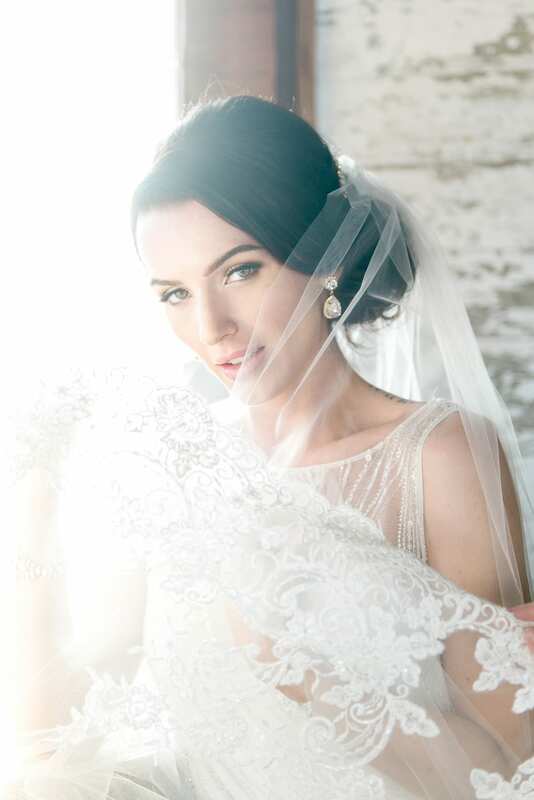 The budget-friendly look features an empire-line mermaid gown with a bateau neckline. 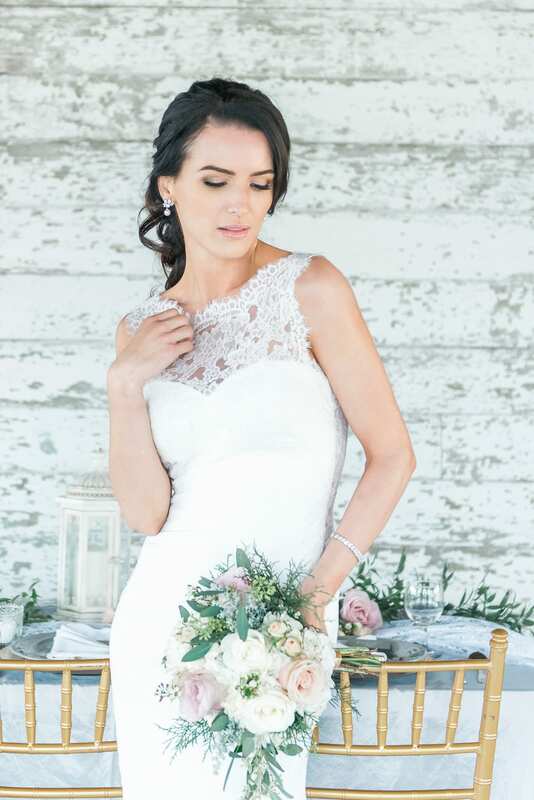 Crepe, tulle, and lace are a truly elegant combination with floral detailing and a low sweetheart neckline. 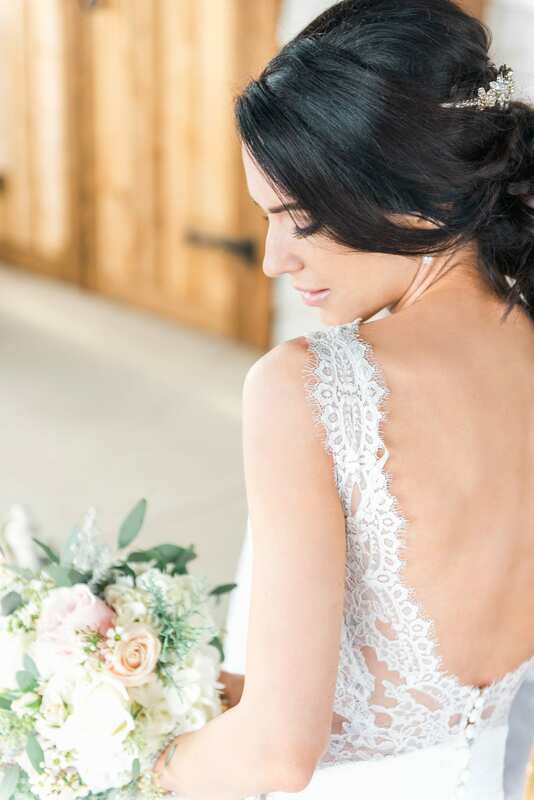 For the second look, the same mermaid silhouette featuring a V-open back, sweep train, and gemstones. 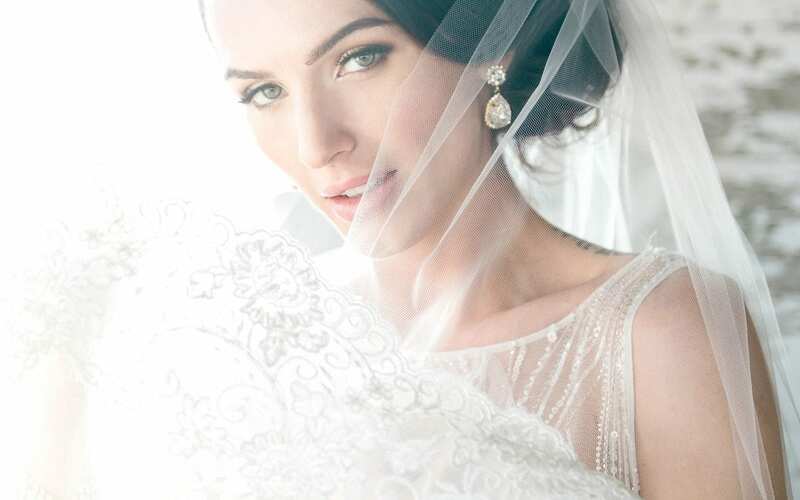 It’s a similar but slightly more glamorous look. 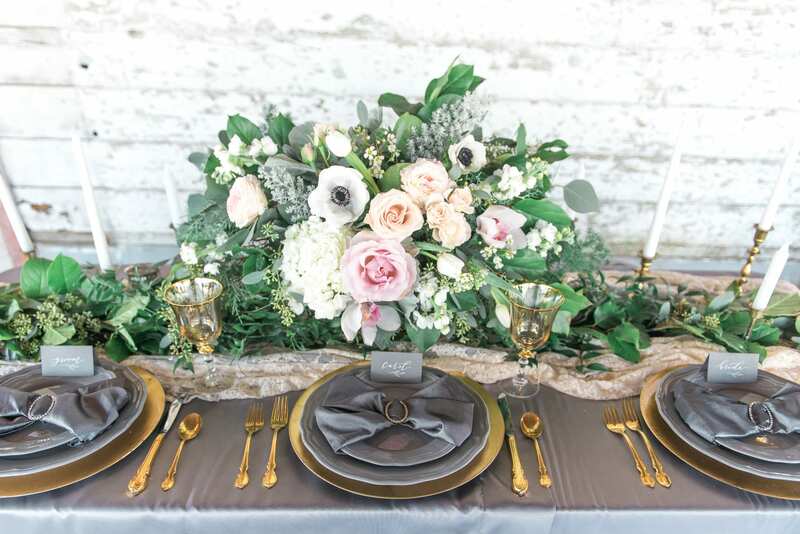 The first look showcases white hydrangeas and roses, both affordable picks. 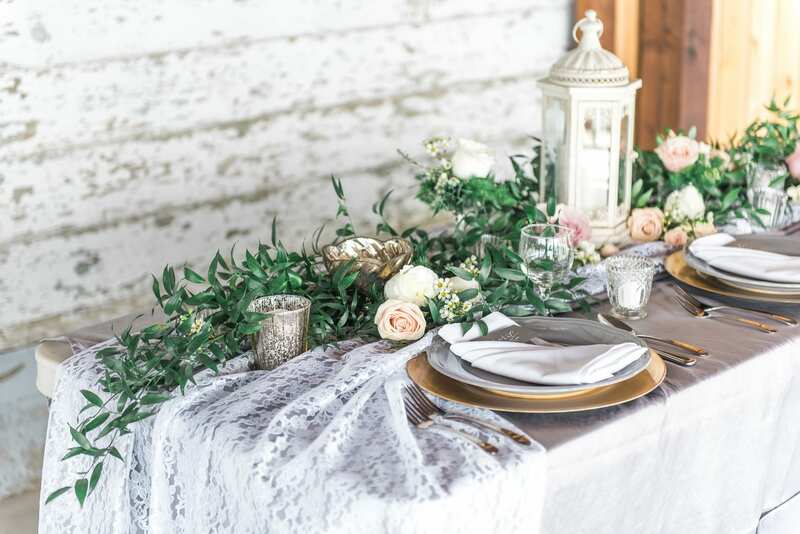 Hydrangeas especially create elegant fullness without a heavy price. 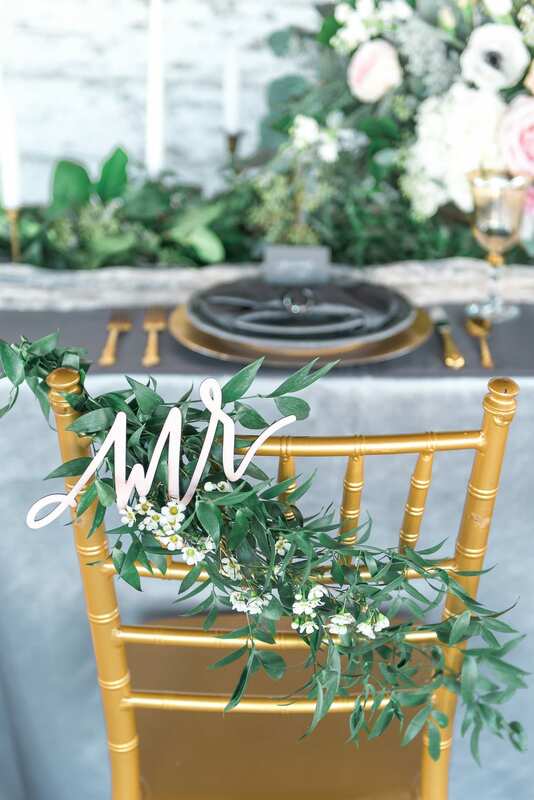 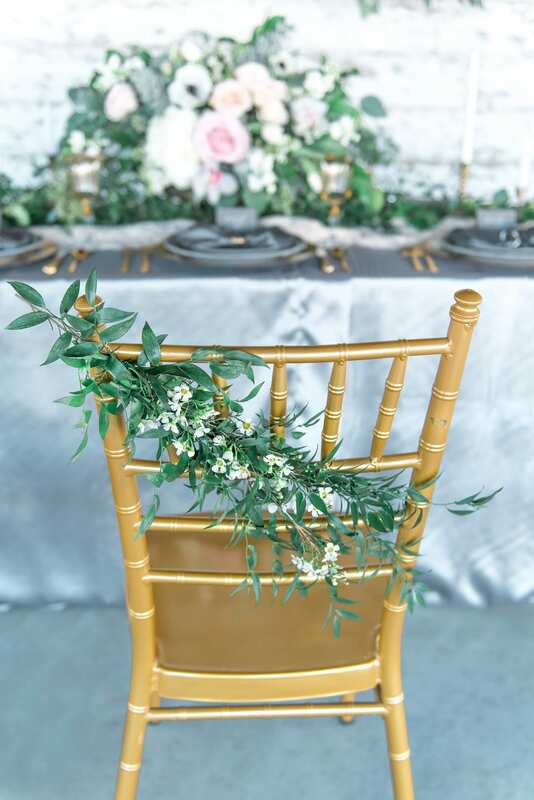 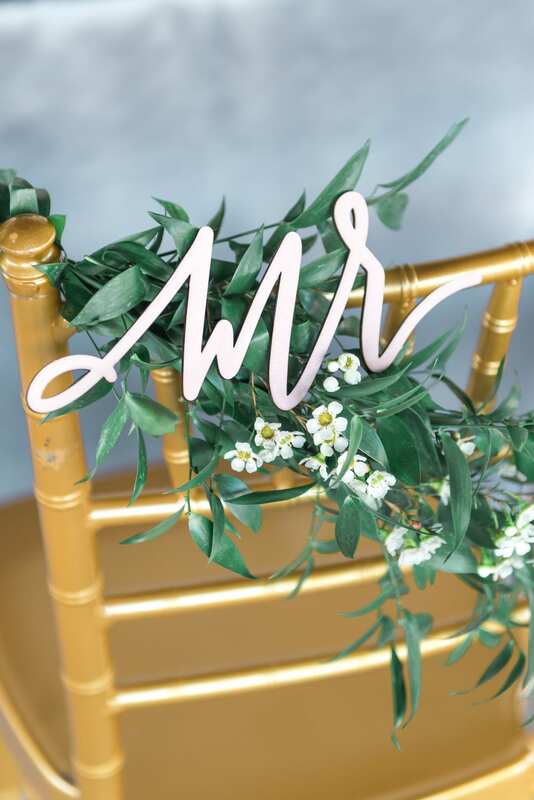 The table garlands were made with stems of Italian ruscus and cut flowers–without twined techniques, and only one type of greenery, a lot of labor costs were cut. 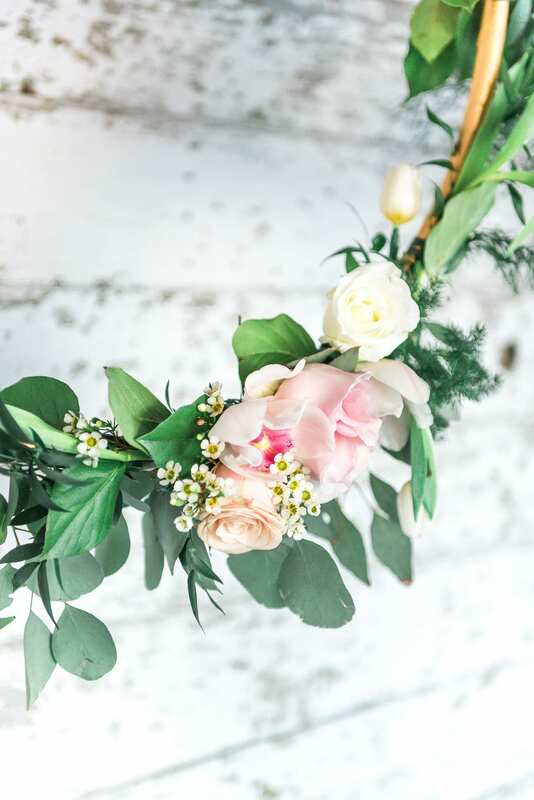 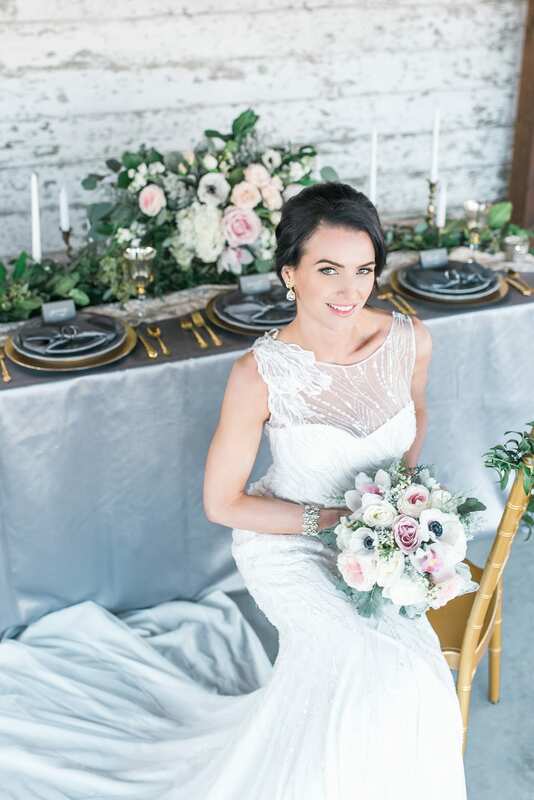 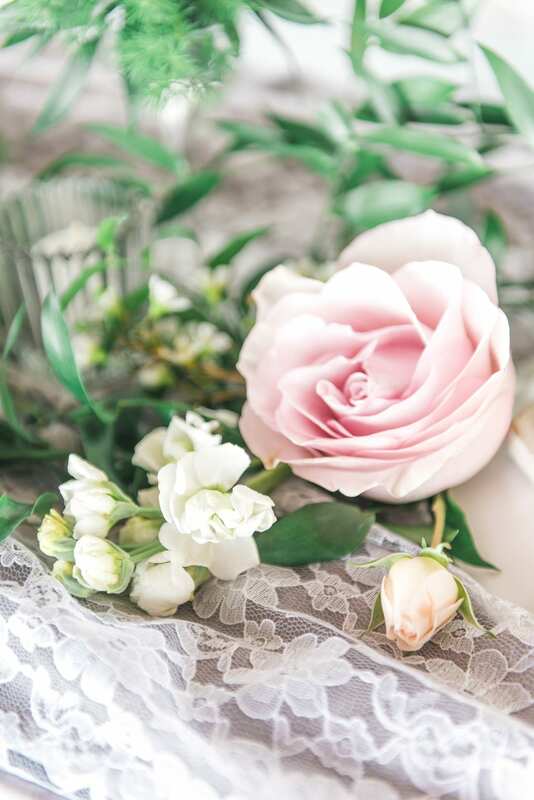 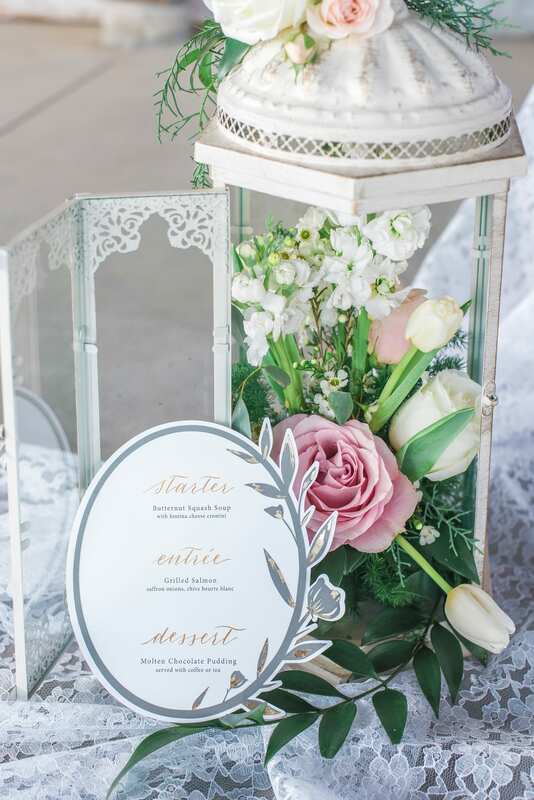 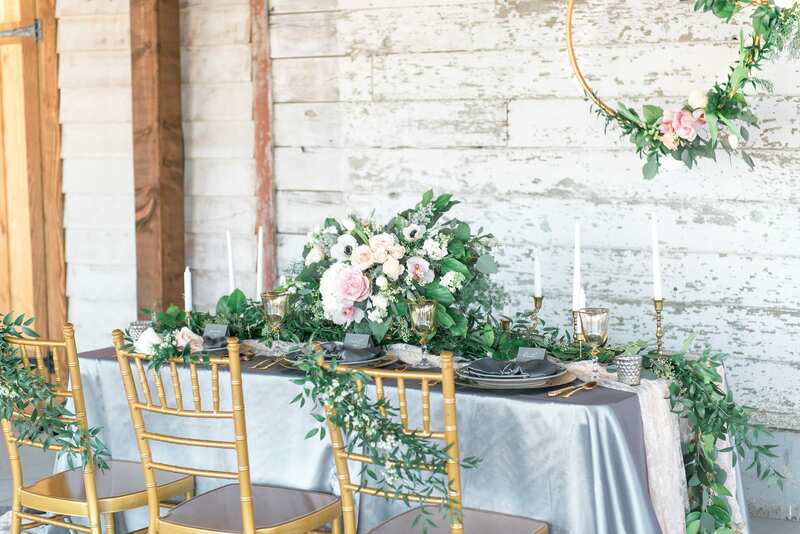 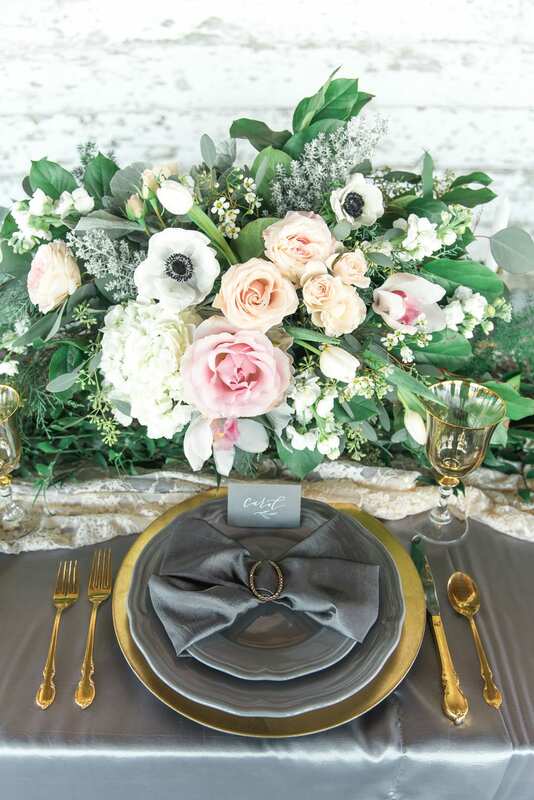 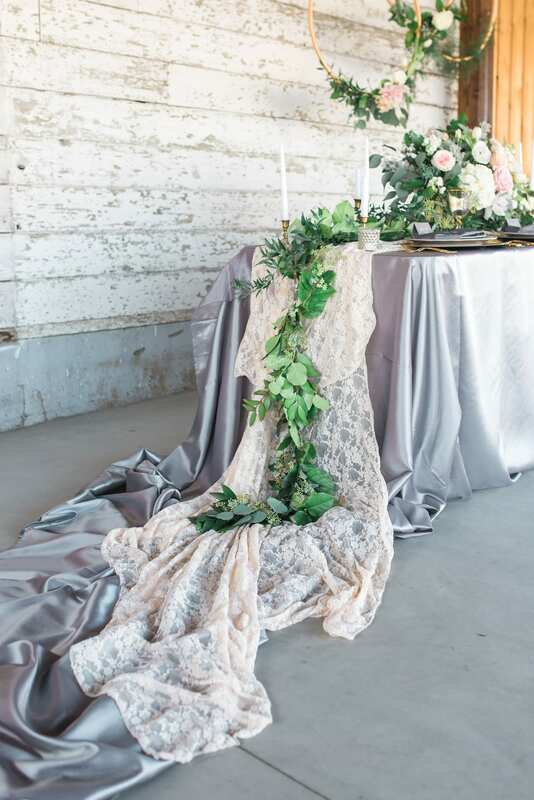 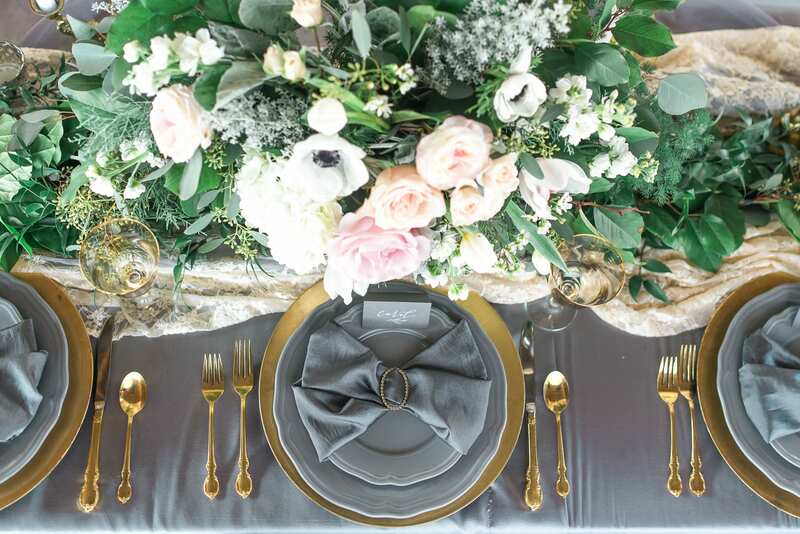 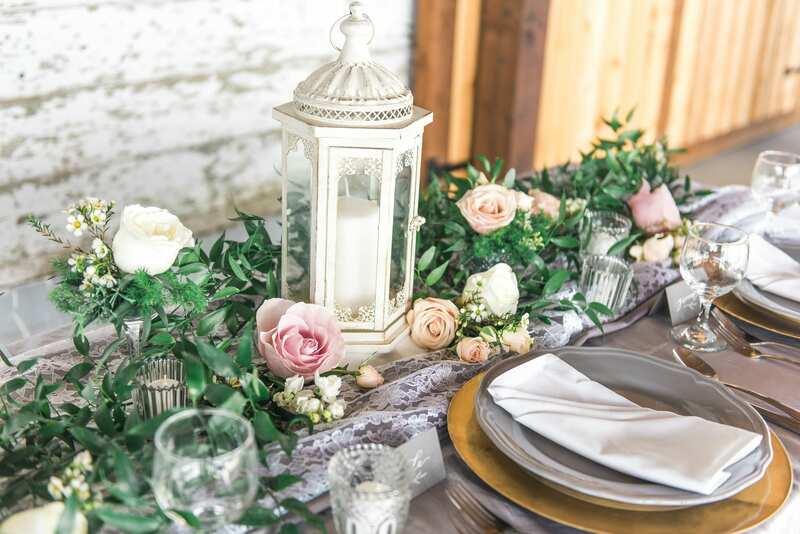 The more expensive look features gorgeous but high-end roses, ranunculus, anemones, orchids, and dusty miller. 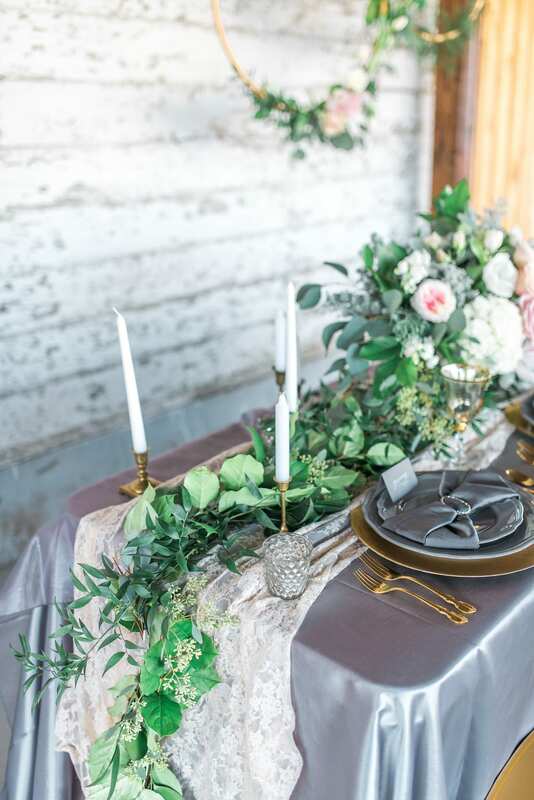 The table garden is fuller, with bunches of greenery to create a layered effect. 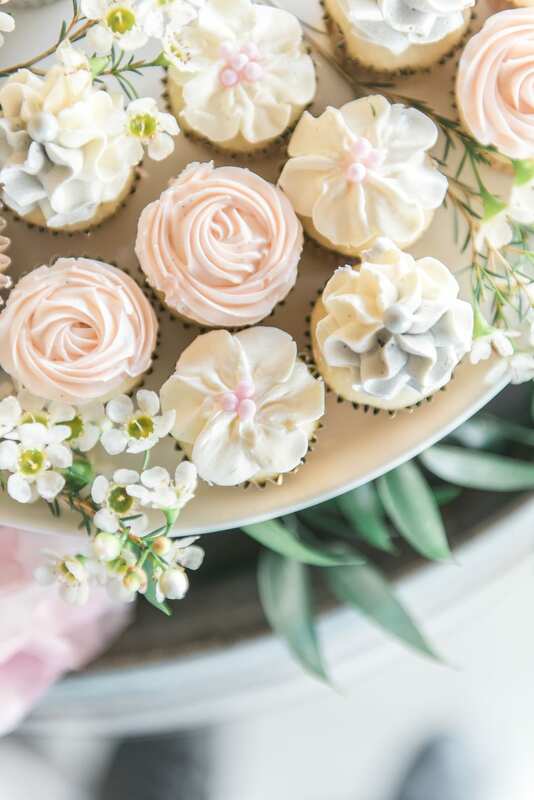 A cupcake tower typically will run you less than a traditional cake, and using both miniature and regular sizes add variety. 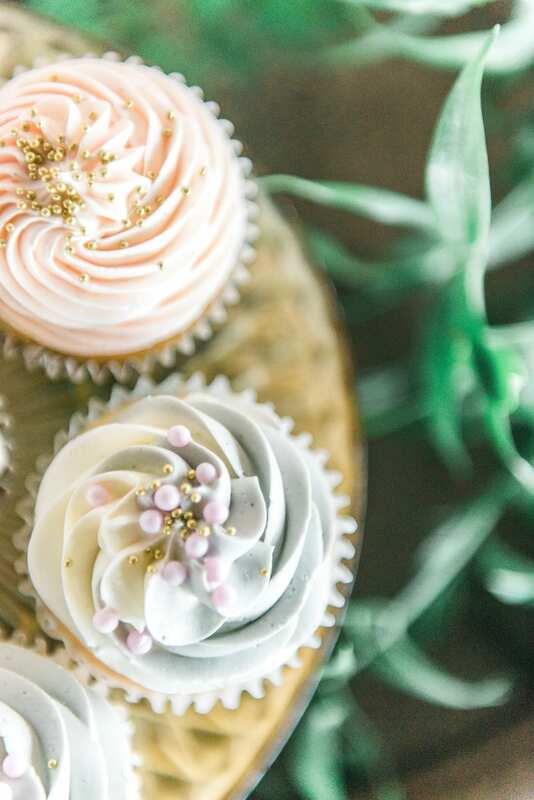 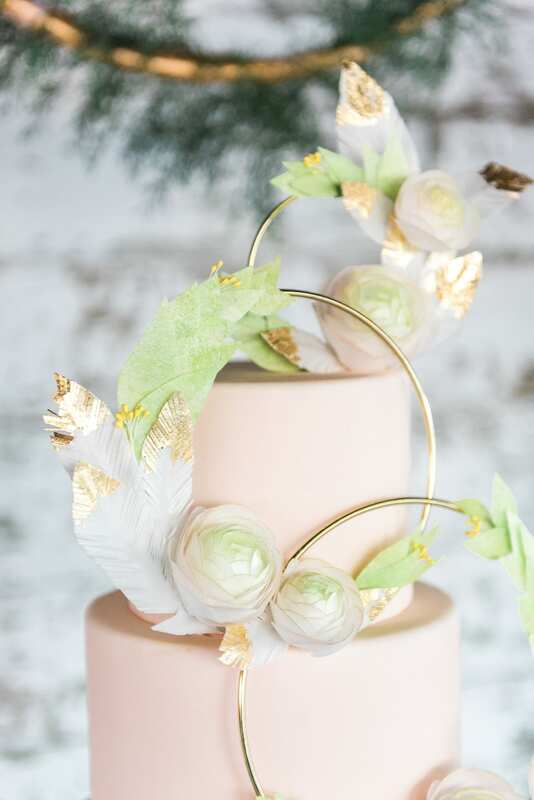 The lightly hued buttercream is given a touch of elegance with edible gold pearls. 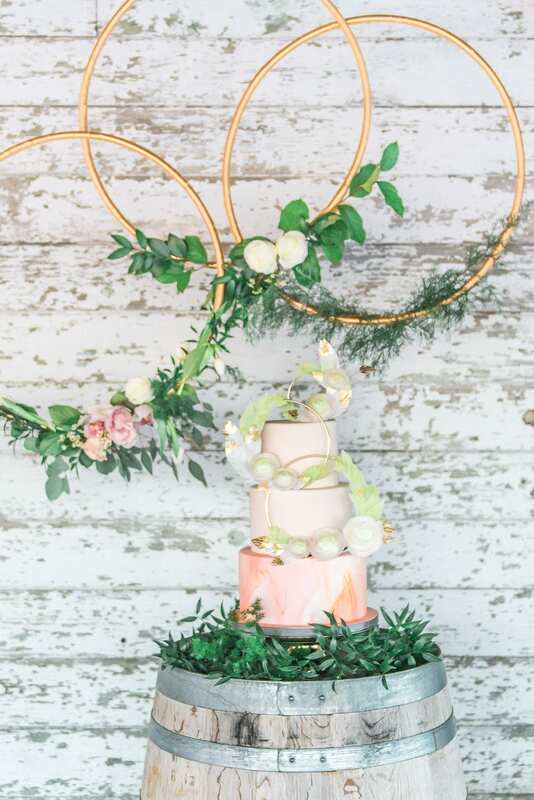 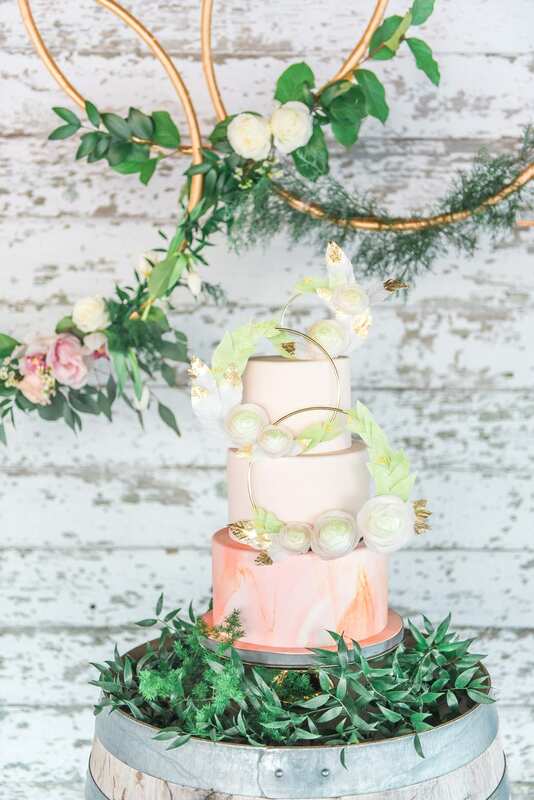 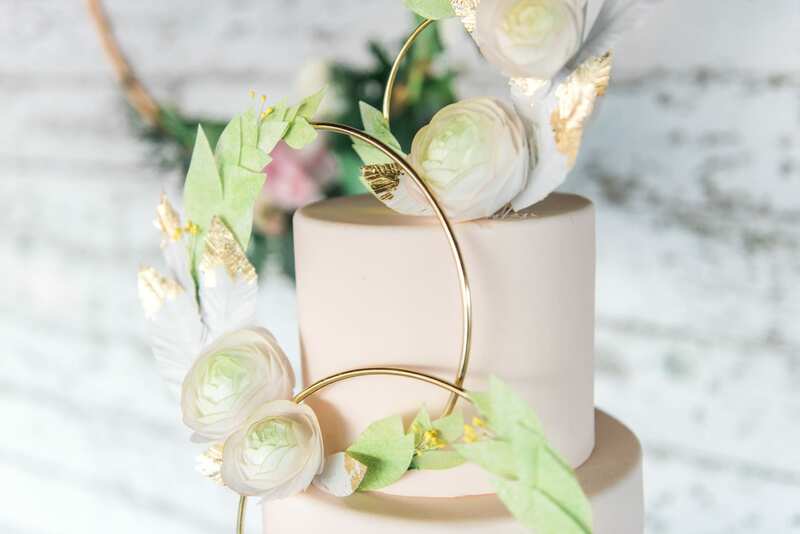 For more generous budgets, this three-tiered cake features peach-toned fondant, intertwined gold rings, and dipped feathers. 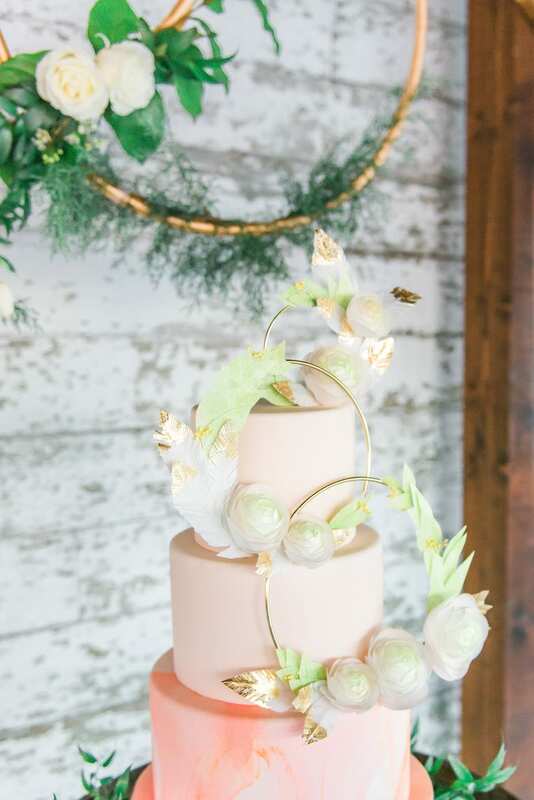 Both elegant and modern, a cake this size feeds about 80 people. 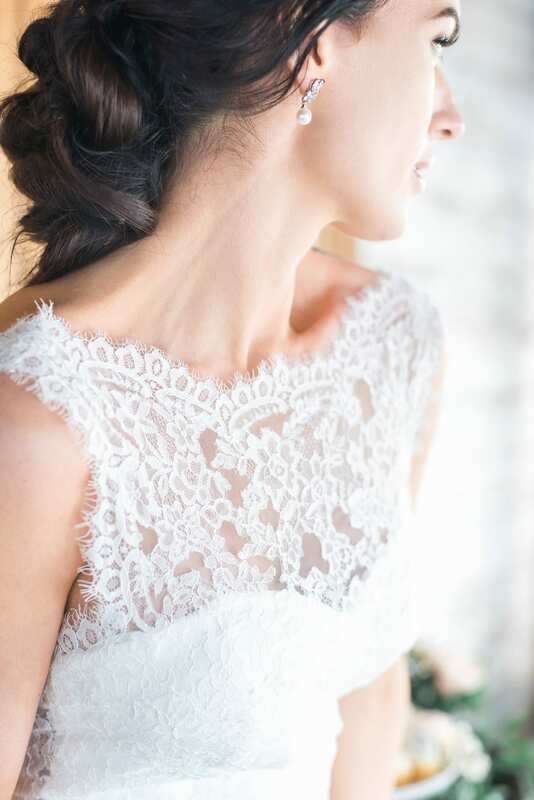 Whatever your budget, you can find a beautiful look! 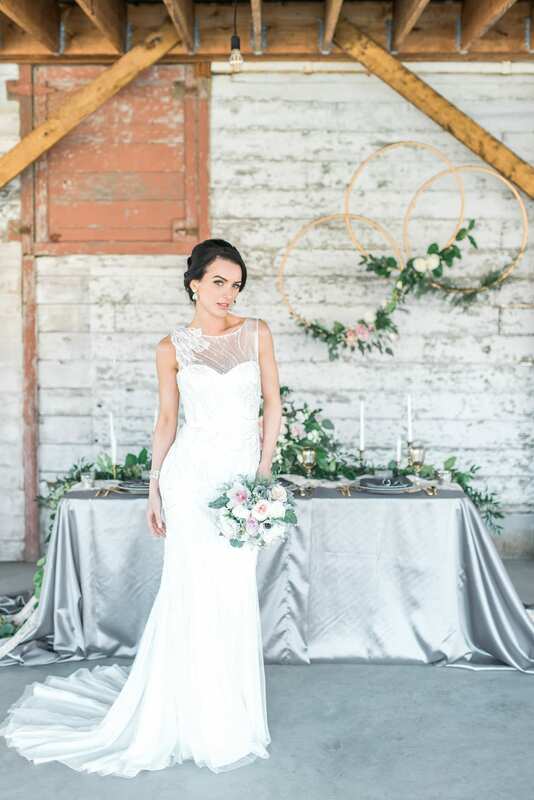 Try starting by talking with a consultant for affordable wedding dresses, bridesmaid dresses, and even accessories.